This fine portrait shows a distinguished-looking gentleman in a powdered wig worn en queue with side buckles (rolled curls). He is wearing a blue coat with a deep collar and brass buttons over a striped waistcoat, frilled chemise and white stock. The portrait is signed on the obverse ‘P.J. 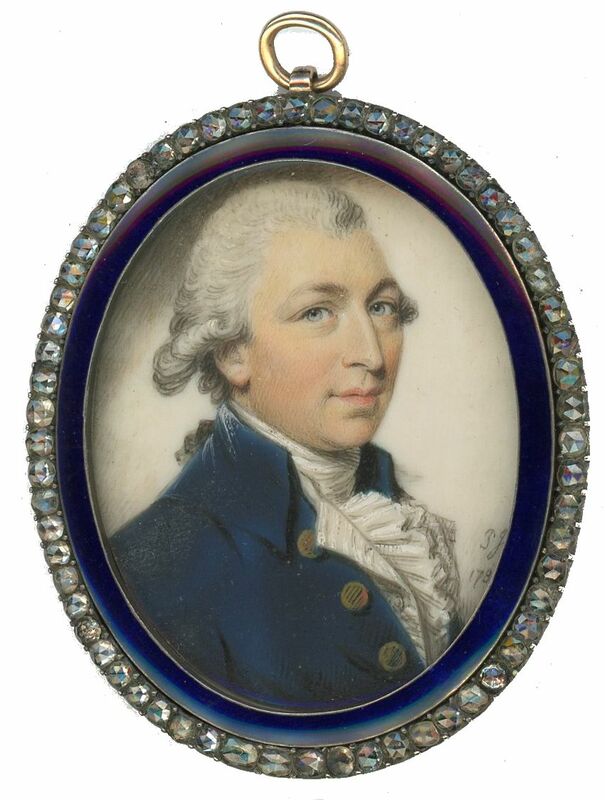 / 1787’ and is presented in an attractive gold frame with a blue enamel and paste stone surround. An original brooch pin fitting has been removed from the reverse side of the frame. Excellent condition. The sitter has traditionally been identified as John Manners, Marquess of Granby (1721-1770) but comparison with other portraits of the Marquess does not readily support this. Born in Jersey, Philip Jean only took up painting upon his retirement from the Royal Navy. He exhibited at the Royal Academy between 1787 and 1802.